I have a few “signature” pieces that maybe get worn once a year, and the rest of the time they are stored in the dark, waiting to be shown off again. It’s kind of sad, really. Something I love so much, used so rarely. So I’ve started to use some jewelry pieces as decor. I have a Pottery Barn lamp (hello, floor model), on my side table/dresser in my room that has a basic cream shade. 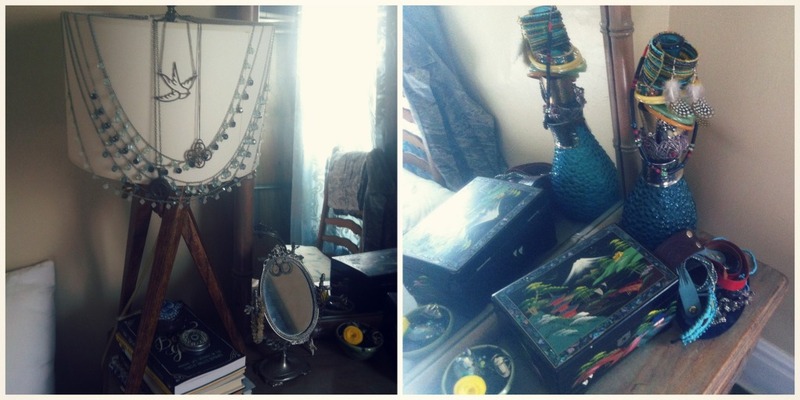 I draped a few jeweled necklaces over the top, and voila, I get to enjoy the lamp and necklace in a greater light. I also have a bubble vase that isn’t quite my style, but with its long neck, it makes for a great bangle holder. And how great is that jewelry box next to it? That was my Grandmother Ruth’s who I’m pretty sure picked it up in Hong Kong. My other bracelets are stacked on top a gorgeous plate from Honduras, and you can just make out a small piece of pottery from Tasmania that holds my rings. It’s an around the world decor in my bedroom. beautiful! i love the way you use pieces to decorate. so glad i got to see you for a bit today. i miss you! and i will not ping you. HA!